Two eras of competitive Quake clashed in Dallas today, as the first world championships were held for the early access Quake Champions, awarding $1 million in prize across the tournament. 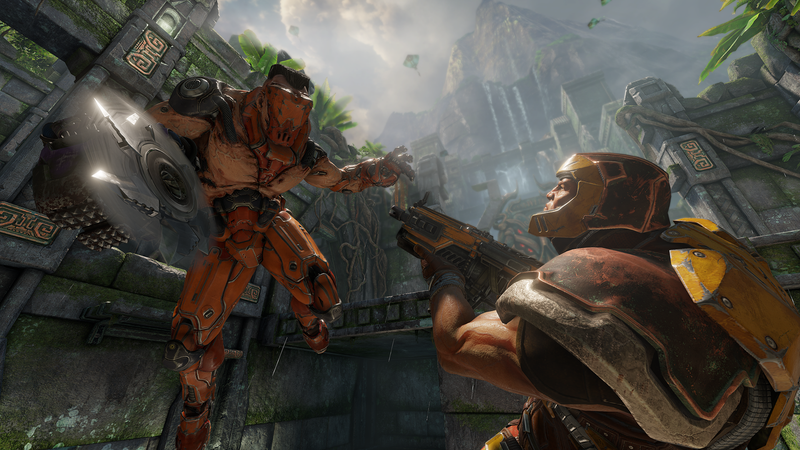 19-year-old Nikita “Clawz” Marchinsky came into this year’s Quake World Championships Duel as the young Quake Live talent, taking down players like “cooller” to earn a spot in the grand finals. His opponent, Sander “Vo0" Kassjager, is a veteran of the Quake scene, playing since the Quake II days. Earlier that day, Marchinsky had hoisted one trophy over his head alongside his team 2z after wining the Sacrifice championships. In the Duel finals, he would have to take this one on his own, in a best-of-five set against a seasoned pro. Playing in the Sacrifice finals seemed like a boon for Marchinsky, as he hit the ground running with kills on Kassjager. The commentators lauded Marchinsky’s aggression and accuracy, and both were on point throughout each round. Some skirmishes between the two came down to a sliver of health, as they hopped and strafed, trying to keep their champion pool alive. Each death meant losing your active champion and moving to a new one, and certain champion’s skills (like Sorlag’s Acid Spit or Nyx’s Ghost Walk) are critical tools in securing a frag. Both played the kind of high-level Quake you would expect at a championship, timing power and weapon spawns to both keep their arsenal stocked and track their opponent’s movement. The bunny-hopping, rocket-flinging carnage of classic competitive Quake was alive and well in the championship match. As the games kept on though, Marchinsky continued to pull ahead. Despite dropping a few rounds, he never let enough go to lose a game, and at the conclusion of game 3, Marchinsky emerged victorious, securing two championship wins in Dallas. In total, Marchinsky takes home $100,000 in Duel winnings and a slice of 2z’s $300,000 prize earnings for the Sacrifice championships as well. If you’d like to watch the entire finals, you can catch the videos in Quake Championships’ Twitch archives.